Next: Improv Cooking Challenge: Ebony & Ivory = Black & White Cheesecake! Previous: Oatmeal Coconut Toffee Peanut Butter Chip Cookies! 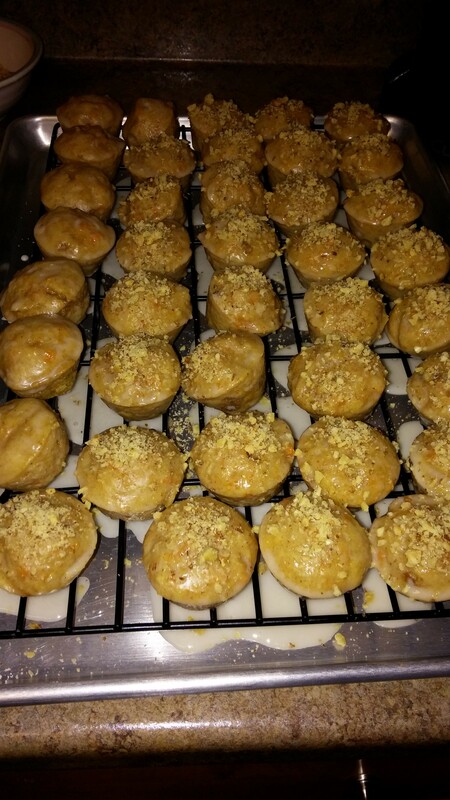 Baked Carrot Cake Donut Holes! Picture a moist, smooth, delicious bite of velvety carrot cake in your mouth…mmmmm…. Now, you can have that same delicious bite, but in an easy, bite-sized mini baked donut! I know I’m a chocoholic, but carrot cake is one of those desserts that really is just GREAT, no chocolate needed. I’ve made a few carrot cakes over the past year or two for my friends’ and family members’ birthdays. Apparently it’s a popular favorite! 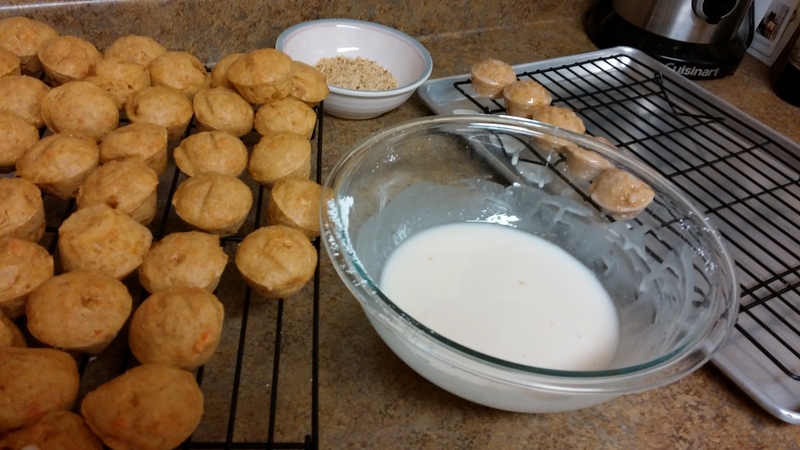 This time, I decided to mix it up a bit by making these carrot cake donut holes. They have a delicious glaze on them adding the perfect amount of sweetness, and the toasted walnut pieces add a little crunch on top. For the carrots, I steam them first until they can be pierced with a fork. Then, put them in a food processor and puree. This is one of the secrets that makes these so moist! You can eat these for breakfast, snack, dessert, or…anytime! As I mentioned before, these were for a friend’s birthday. A group of us went away to a cabin for the weekend to celebrate, and we basically grazing on these throughout the weekend. Makes about 4 dozen donut holes. 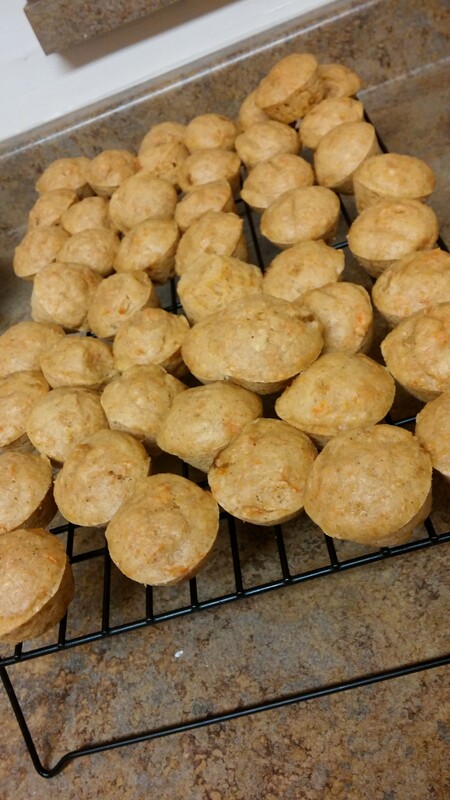 1) Preheat the oven to 375 degrees F. Spray 4 dozen-worth of mini muffin pans with non-stick cooking spray. Set them aside. 2) In a large bowl, whisk together the flour, baking powder, salt, spices, and brown sugar. 3) Switch to a rubber spatula. Fold in the wet ingredients until everything is just combined. 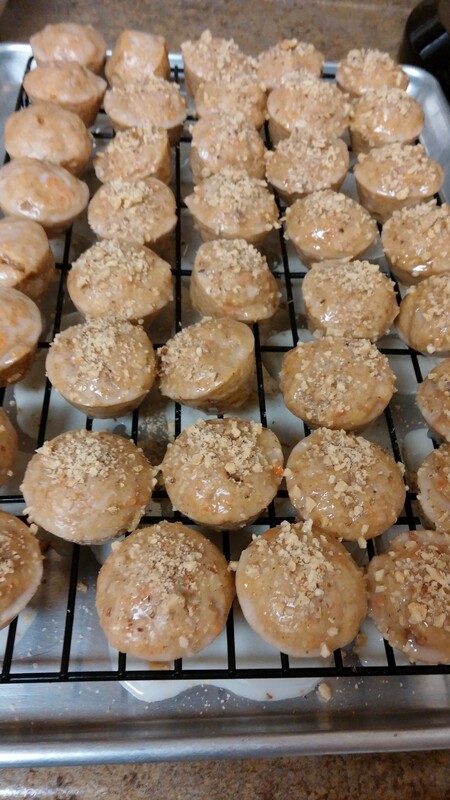 4) Using a small cookie scoop (or spoons), scoop the batter into each mini muffin pan, filling about 2/3 full. Bake them in the preheated oven for about 12 minutes, or until the tops are set (not wet anymore). 5) Allow them to cool in the pan for about 2 minutes. Then remove the donuts from the pan onto a wire cooling rack. 6) Now, time to glaze! Whisk together the powdered sugar (make sure you sift it first), the milk, and the vanilla. Dip each donut hole into the glaze in the bowl. Roll is around to fully cover it, the move it onto a wire rack that is on top of a cookie sheet. This will catch the drips. Continue this process and about every dozen, sprinkle on the walnuts. My set up for it looked like this! YUM, I hope you enjoy!! Donut or Doughnut– what’s right? 🙂 What kind is your fav? ?